John Evangelakos is co-head of Sullivan & Cromwell’s cybersecurity group, IP and technology group and a member of the firm’s M&A group. Mr Evangelakos has led transactions in a wide variety of industries, including in the technology, cybersecurity and financial services sectors. Mr Evangelakos’s clients have included AkzoNobel, Anheuser-Busch InBev, Axel Springer, Barclays, Eastman Kodak, Intercontinental Exchange and Microsoft. He represented Intercontinental Exchange in its acquisitions of NYSE Euronext for $8.2 billion, Interactive Data Corporation for $5.2 billion and Standard & Poor’s Securities Evaluations and Credit Market Analysis businesses. He also represented Axel Springer in its acquisition of Business Insider – a leading digital offering for business news – and Eastman Kodak in the $527 million sale of its digital imaging patent portfolio to a consortium organised by Intellectual Ventures and RPX Corporation, which was pivotal to the restructuring and emergence of Eastman Kodak Company from bankruptcy. 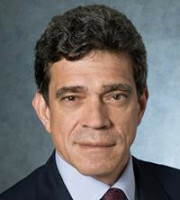 Mr Evangelakos has been recognised as a leading lawyer in leveraged buyouts and private equity by The Best Lawyers in America, as a leading lawyer in mergers and acquisitions by New York Super Lawyers, as a recommended transactional IP lawyer in the IAM Patent 1000 and listed in The Legal 500 United States for patent licensing and transactions.